Take a bite of the brownie-like Double Chocolate Cookie, made with cocoa and chocolate chips. CAPSULE REPORT: When you’re in the mood for a comforting home-baked cookie, but don’t have the inclination to fire up the oven, call upon Sugar Flower Bakery. The small company makes classic comfort cookies that bring you back to childhood days in Mom’s or Grandmother’s kitchen, when nothing tasted better than homemade cookies, whipped up from scratch. If your family didn’t bake, we’re sorry; but you can still enjoy the experience one step removed. We love all the flavors; they make charming cookie gifts. People who love chocolate and mint are advised to buy a lot of the Chocolate Mint cookies. 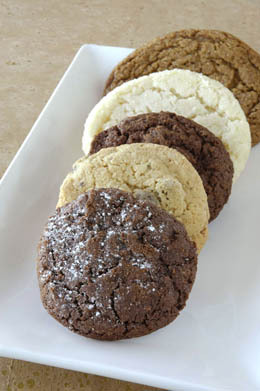 Sugar Flower Bakery makes six varieties of cookies. They are sent fresh from the oven, baked the day the order is sent out. The cookies are mostly two inches and three inches in diameter. Classic Chocolate Chip Cookie tastes just like it sounds. A wonderful chocolate chip cookie that is the perfect solution, when only a chocolate chip cookie will do (two-inch diameter). But please, don’t just order the chocolate chips—everything here is just so good and deserving of your attention. 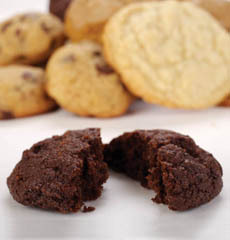 Double Chocolate Cookie has flavor notes a brownie in a crisp cookie (two inches in diameter). The chocolate cookie with chocolate chips delivers that double chocolate whammy that immediately satisfies even the strongest chocolate craving. Can we say chocolate one more time? Gingersnap is a comfort cookie, rich and spicy with molasses. This is a classic rendition of a timeless goodie (three inches in diameter). Gingersnaps and vanilla ice cream are an old-fashioned dessert. Bring it back into fashion in your house. Add a dab of chocolate sauce. From bottom to top: Mint Chocolate Chip, Chocolate Chip, Double Chocolate, Lemon Sugar and Gingersnap. Photo by Dhanraj Emanuel. Iced Pumpkin Cookies, a seasonal specialty, are soft, moist and 1½ inches in diameter—a wee, round version of a pumpkin loaf cake. Delicious by themselves, full of pumpkin flavor, they come with a small pot of brown sugar icing for those who prefer added sweetness. The least sweet of the cookies, they can easily be served at brunch, and are just perfect with a cup of tea in the middle of the afternoon. Lemon Sugar Cookie is a classic hard sugar cookie with a fresh lemony profile. Three inches in diameter, it’s a generous tea cookie or snack. Serve it for dessert with lemon or orange sorbet. Chocolate Mint Cookies are not easy to find. Pardon us for attacking a sacred cow—we sold and ate many a Girl Scout cookie in our day—but today’s Thin Mint cookies (and the rest of the Girl Scout-branded cookie line) are manufactured with so many artificial ingredients as to taste like fake food. If you want a real Chocolate Mint cookie, this is a winner (two inches in diameter). These are cookies that will remind you of home. Each is familiar with just a little twist, and each bite is delectable. You can even pretend that they’re from Mom. 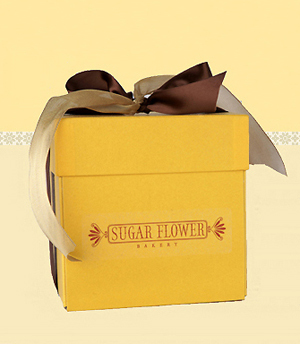 What could be better than a cheerful box, filled with freshly-baked cookies?